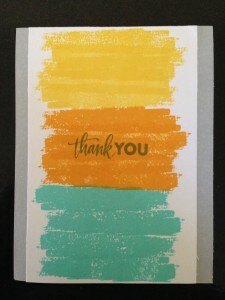 I really can’t keep away from Simon Says Stamp’s Brushstroke Messages stamp set. I created a set of Lunch Box Notes for my kiddos using it. Extra Details: I began by cutting my cards. 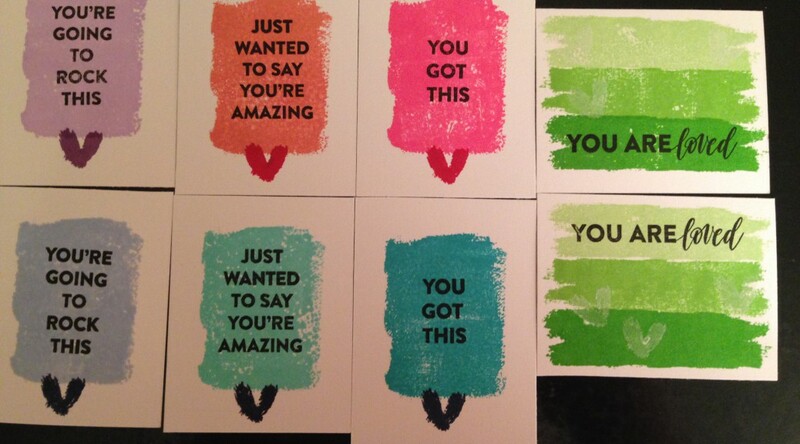 Then I stamped the large colored block on each card. I added the sentiments in black ink. For a little interest, I added a heart to each card with a slightly darker color of ink. The green cards have three shades of green ink and white pigment ink hearts. World Card Making Day was so much fun. I watched a ton of inspirational videos on YouTube and created a number of cards also. I made this card using the Simon Says Stamp October 2017 Monthly Card Kit. This is the only card I made with the papers today; I got distracted by the stamp set and never looked back. 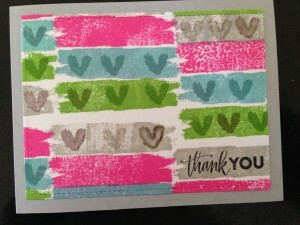 Extra Details: I began this card by cutting some of the patterned paper in the kit. I cut this panel to 4 x 5.25 inches. I adhered it to a dark blue card base. I cut a small rectangle from another pattern paper and white heat embossed the sentiment. I adhered the sentiment panel to the card using foam tape. 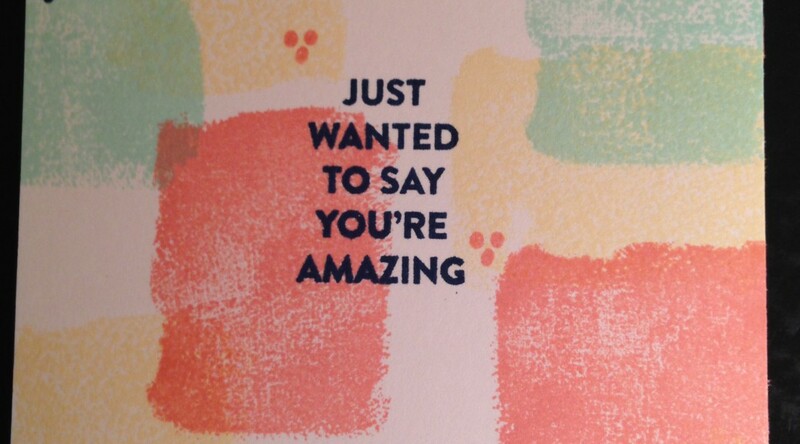 I keep this card simple because the patterned paper adds all the interest and shine that it needs. World Card Making Day was so much fun. I watched a ton of inspirational videos on YouTube and created a number of cards also. 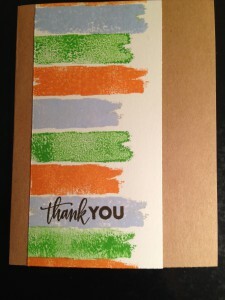 I also watched Nina-Marie Trapani’s video called Brushstroke Pattern Stamping Featuring Simon Says Stamp Products. I have the Brushstroke Messages stamp set and couldn’t wait to try out some of the ideas Nina-Maria demonstrated. I also just got some of the Lawn Fawn Mini Ink Cube Sets in the mail and wanted to play with those. In the end, I made 8 cards. 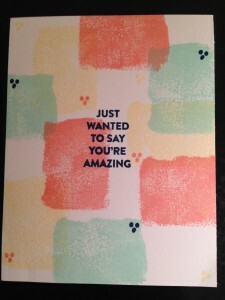 Card One using Hero Arts Color Layering Rooster Ink set. There was some ink transfer when I switched from the red ink to the yellow ink, but I really like the orangey color that it created. Card two using Lawn Fawn’s Tropical Island Ink Cube Pack. I trimmed the sides of the panel down to allow the grey card base to show on each side. Card Three using Lawn Fawn’s Candy Story Ink Cube Pack. I die cut the bottom edge of the white panel with a stitched cloud border die for interest. Card Four using Lawn Fawn’s Gazebo Ink Cube Pack. I die cut the panel with a stitched rectangle die before adhering it to a grey card base. 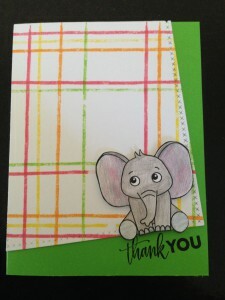 Card Five using Simon Says Stamp’s Fresh Fruit Hybrid Ink Pad Cube set. I die cut this panel with a cross stitched rectangle die at an angle. I also added a cute critter that I found in my stash. Card Six using lawn Fawn’s Pumpkin Patch Ink Cube Pack. I trimmed the panel down and adhered it to a kraft card base. Card Seven using Lawn Fawn’s Tea Party Ink Cube Pack. I die cut the panel with a stitched rectangle die. I added two smaller layers with some foam tape. 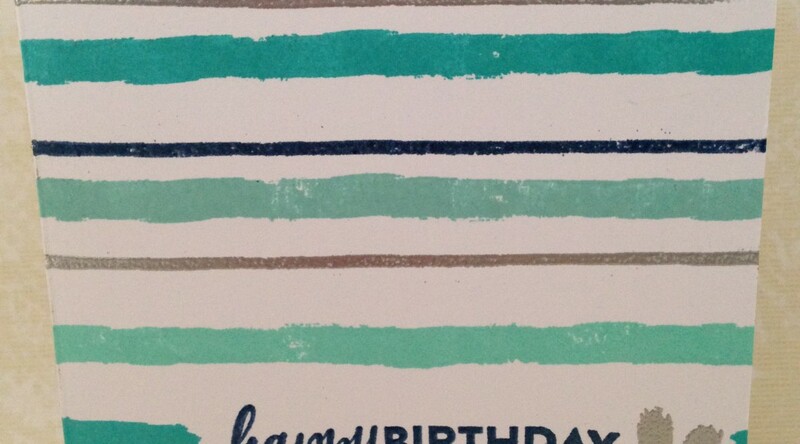 I stamped the green ink on the larger layer to create matching paper. Lastly, I added a few sequins for some sparkle. Card Eight using Lawn Fawn’s Ice Cream Parlor Ink Cube Pack. I added the small dots for some interest. 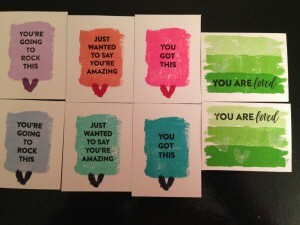 Extra Details: I stamped each panel with a stamp from the Brushstroke Messages stamp set. I die cut a few of the panels for interest and variety. 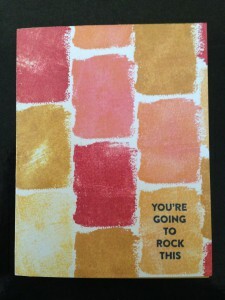 This card was inspired by the current Simon Says Stamp Monday Challenge: Heavy Metal. 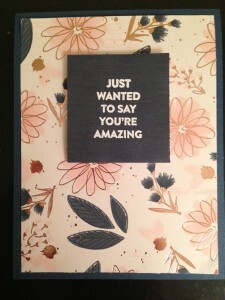 I had just received the SSS October Card Kit and the new Steel Navy embossing powder. It is such a cool embossing powder; it appears to be a dark metallic blue. 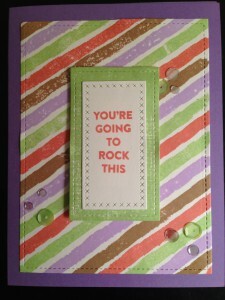 Extra Details: I began this card by stamping and heat embossing the sentiment on the lower part of the card base. 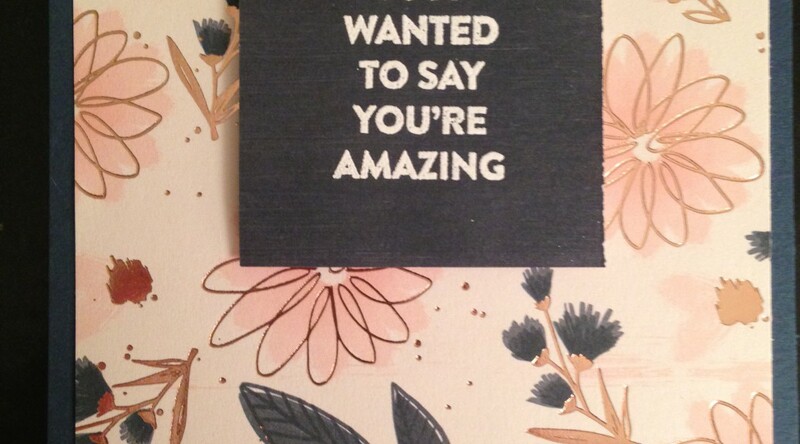 I used the navy embossing powder for the sentiment. I added a heart with silver embossing powder. 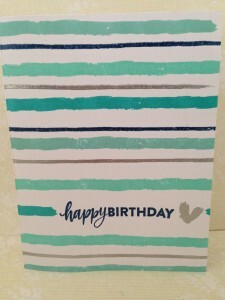 I added stripes to the rest of the card using the same embossing powders and three shades of aqua inks. 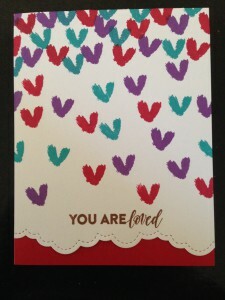 It was a very simple card to create; however, I love the results.